Please click on images to enlarge them, or for more information! 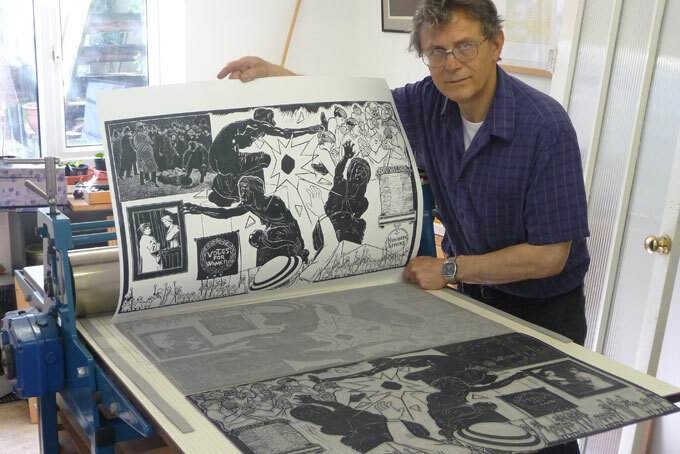 Off-setting the key design of “Homage to Edith Downing” on to new lino blocks for additional colours. I have been making art (and thinking about art) for most of my life. 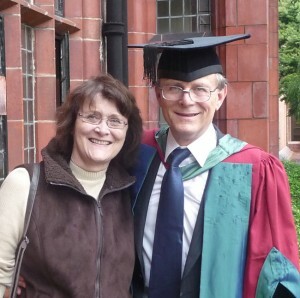 My wife Margaret and I after my PhD award in the Philosophy of Art at Cardiff University in 2009. Click on Highlights for a quick overview of my work. For more detail, visit the separate pages of Artworks and Ideas. You are welcome to comment and join in the various debates found in the Ideas pages. There is a navigation guide to using this website called, Website Info’, an About Me theme and a Blog about my current activities. Although this website is clearly a shop-front for my work, the Gallery and Shop thread, for direct sales, has yet to be constructed. Meanwhile, if you wish to enquire about any item featured, please approach me via the Contact page. 1) I was privileged to meet Natalie d’Arbeloff in 2012 at a private view, where I admired her autobiographical narrative painting in an exhibition of ‘concertina-style’ Chinese Books curated by artist Mary Husted. Natelie d’Arbeloff’s website combines her art and her personal history in a way which inspired me to attempt my own multi-themed website. 2) Nevertheless, I could not have begun any sort of website (after a 10-year procrastination) without the skills and expertise of Computer Consultant Steve of ParkIT. Thank you, Steve!